This is our friend John. The other night, for the very first time in his life, John held a kitten. "Am I doing this right?" he asked. He was, and we handed him another kitten. "Oh, no, no, no, not another one. This is too much!" So, we handed him another kitten. And John successfully corraled five wiggly kittens on his lap. Our smiles were as huge as John's as we watched this sweet scene. Love it. 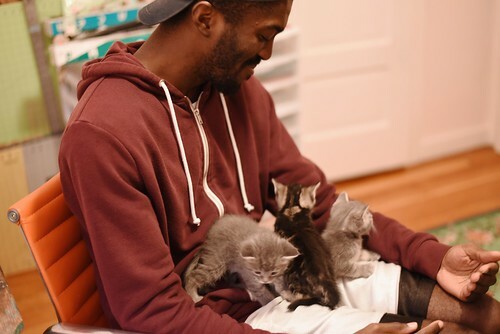 Who doesn't love a handsome man with an armful of kittens? I think he needs to take a few home!! That was my first thought! The cat mojo is strong with John. I am not sure his smile could have gotten any bigger. What a great bunch of pics! I hope he is able to get a kitten of his own some time soon. Awwww! How adorable! It looks like John is doing an excellent job as kitten wrangler intern. He'll be ready to start his own IBKC branch office in no time. I doubt they will ever be held in hands as beautiful as these again! 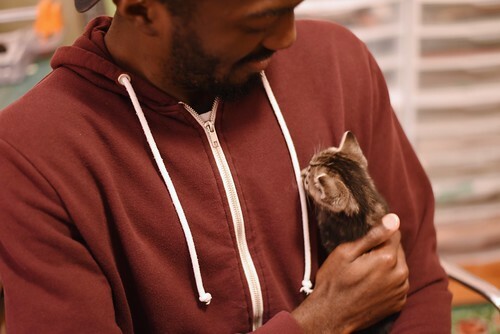 Real Men make laps for kittens and love it! Good Job John (and Lori for teaching him how). Is it too much to hope that (at least) one of the Huddlestons will find a furrever home with John? I have it on good authority that men named John are exceptional cat dads (my hubby is named John). Men named Brian make A+ cat dads as well. The hubby of a friend is steadfastly devoted to their ten cats and an attentive foster dad to the cats who are temporary residents. The joy on John's face is apparent, and brought a smile to mine as well. I hope he ends up with a Huddleston or two! My face hurts from smiling so big at these pictures! As Sybil Ann said, I think we have another convert! Mine, too! I don't think I've ever seen a more adorable post! So cute! Which Huddleston(s) is/are going home with John??? That would be a bargain at twice the price - whatever the price is! 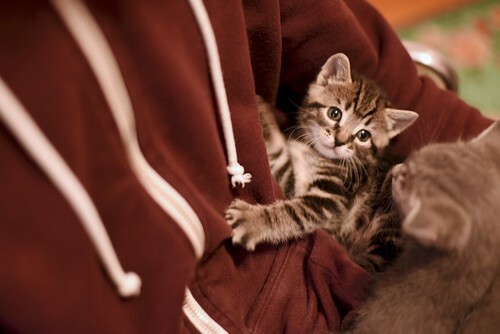 Oh that 2nd to last one where the kitten is smiling....John is a natural with kittens. The obvious glee in his smile gave me the same perma-smile. 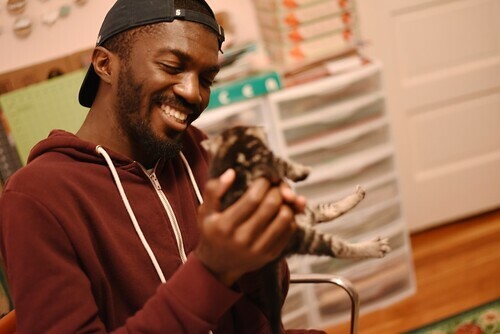 I've never watched an adult hold a kitten for the first time. What a treat! This is the cutest thing ever. I have a crush on all six of them (5 Huddlestons + John). Aw. He's having so much fun. For some reason I love to see big guys melting over little kittens. Oh John, you are so lucky! An arm/lapful of kittens is one of life's greatest joys :) The smile says it all.